I wrote this last year and wanted to post it again. I added an update at the bottom. I find I feel the same today as I did when I wrote it. Have you ever reflected on little segments of your life and realized just how much they influenced who you are today? One of the big questions that people will ask of each other this weekend is “where were you on 9/11?”. Everyone has a story. Each one unique and each of us on that day were changed. We hugged our loved one’s a little tighter, perhaps were a little kinder and together we bonded in our love for our country. If you have a memory or two tucked away that involves the World Trade Center, chances are you are pondering those as well. 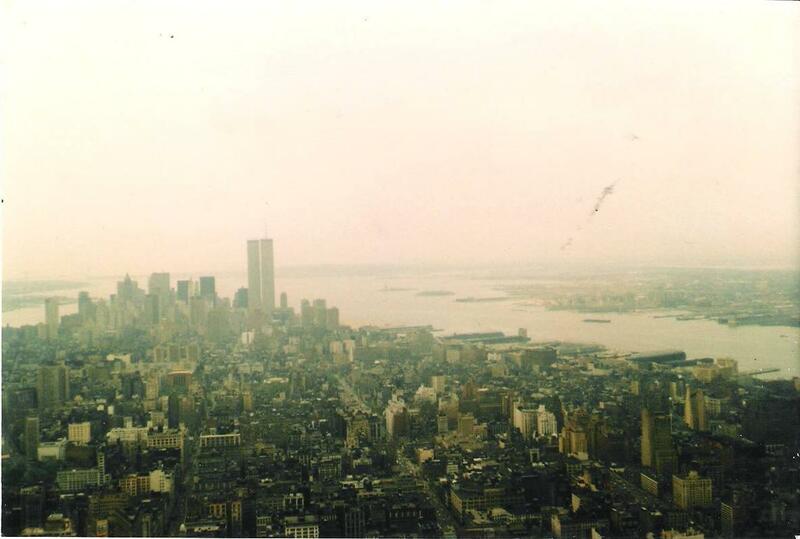 On that day, as I watched the first tower fall and then the second, I couldn’t help but reflect back to my days in NYC and an amazing dinner at Windows on the World with two very special people in my life. They, like the Twin Towers are no longer here. It was a period in my life that was all good. I was a young naive college student studying design at FIT on 27th and 7th. I walked to work at Macy’s and had an amazing roommate and best friend from New Jersey named Lisa. We hung out at Columbia University, Studio 54 and the Underground. We were thin and fabulous. We wore short skirts, stiletto’s and designer clothes. Truth be told, we thought we ruled the world. My Aunt Jinny, a gentle soul that never married, called me one day from Cincinnati and asked if she could come visit for a weekend. I almost selfishly said no…are you kidding me? Give up a weekend to entertain my 60 year old aunt? Thankfully, I had some sense and told her I would love for her to visit. 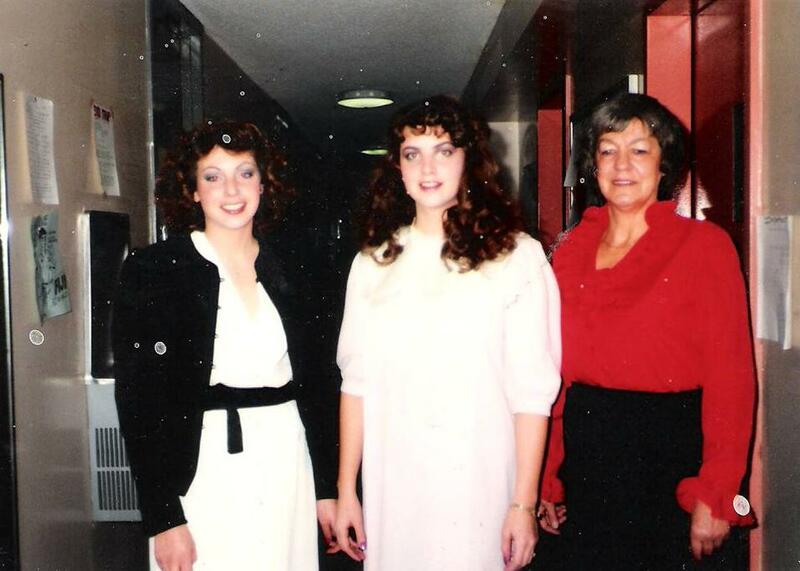 Looking back, Lisa and I had some of our best times with Aunt Jinny over the next two years. We would dress her up, give her a make-over, let her sleep in our dorm and take her out on the town as if she was the college student she never was. In return she would bring us skyline from Cincinnati, take us to tons of musicals and gift us with one special memory – dinner at Windows on the World. It was a magical night. We took hours to get ready and then called a cab to pick us up. As the elevator climbed to the top floor of the tower and the doors opened up, you truly felt as if you were on top of the world. The view was incredible, the bathrooms fabulous and the food delicious. Back then, to us it was about being dressed up and out on the town at an exclusive restaurant that we could never ever have afforded as a college student. Today, I realize it was about being in a magical place that no longer exists with two very special people that meant more to me than words can say and like the World Trade Center… are no longer here. Ginny passed away shortly after the towers fell and unexpectedly, Lisa just a few years ago. I am emotional. I was inspired to write this after I read a post this morning by Thrify Decor Chick; touched by her photos at Ground Zero. Now my mind is flooded with memories of Jinny and Lisa…I miss them. They made me a better person. I wish I had just one more conversation with them… I am glad they knew I loved them. Excerpts from a book written by high school friend Andrea Raynor called A Voice that Calls you Home swirl in my mind as I think about that heart wrenching day known simply as 9/11. In her book, Andrea shares her emotional journey including her days at ground zero blessing body parts and later, her battle with breast cancer. I think of my friend Heath who is getting ready to leave his family to serve yet another year across the world I think of my friend Cheri’s son Jake, and my children’s friends Jason, Zak and Ashley who are all in the different segments of the US Military. They make me so proud. I just want to wrap my arms around them and all the other brave men and woman who are serving our country and working to keep us safe. Have a decorating question? Ask away! Q: I want to have an arrangement of Greek tiles and plates over the fireplace mantel. Is it okay to have the arrangement be a little wider than the mantel? A: My initial thought was no, but as always, you have to sit back and think outside the box. The problem is not going wider than the mantel, it’s creating an arrangement that is “heavier” than the mantel. By extending the arrangement outside the width, you automatically are creating a “feeling” that it is heavier than the mantel which then takes the focus off of the area as a whole. BUT, as always, there are not rules to decorating – just rules of thumb. What I would suggest is if you want to go outside the area above the mantel, make sure you “extend” the width of the mantel with something to the left and right that balances it out such as furniture, large vases with arrangements, low bookcases that look built-in, etc… The one thing I would avoid (unless it’s built-in looking bookcases) is putting anything too “hard” next to the already “hard” fireplace. I always prefer alternating hard and soft. When I say soft I mean upholstered furniture, plants, etc. Q: In my living room, I have a large window that is in a recessed area that is 88″ wide x74″ tall. It’s sort of like a bay window, but not curved. I would like to hang drapes on the outside, from floor to ceiling, but the problem is that across the top of the opening, it’s just the ceiling – there is nothing across the opening at the top, if that makes sense. The ceiling goes straight through to the recessed area. So, even if I hang a rod as close as I can to the ceiling, there will be a gap at the ceiling that goes through to the opening – won’t that look weird? Any suggestions? A: This makes perfect sense Shirley. I actually have the same situation in a guest bedroom that I am working on in my home. You really have two solutions. The first is to locate the rod on the walls to the left and right of the window. The key is to hang the rod as high as you can and to use a drape that will have some material above the rod. Hang it so the top of the drape will almost touch the ceiling. The only issue you have is you really can’t use a support in the middle with a traditional rod, so the rod needs to be extra long so the extender in the middle doesn’t sag. 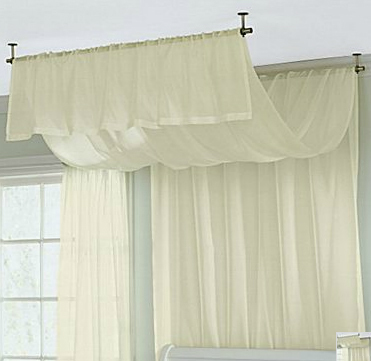 Also, the drapes cannot be too heavy or they will cause it to sag as well. The second option and probably the best one, is to get a ceiling mounted rod – JC Penney and Ikea both sell them. This will allow you to put a support in the middle and will avoid any potential sagging problems. Q: My great room has 1 love seat (solid fabric) and 2 occasional chairs(solid fabric). I would like more seating. Do I purchase another loveseat or 2 more chairs and solid or print? A: This is probably better answered if I could see your floor plan, but generally speaking, here are my thoughts… When planning your seating, there are three considerations. 1) traffic flow, 2)) conversation areas and 3 beauty. Your first consideration is make sure that you know where your main path of traffic will be and to not interfere with that. The second is that you never want to put a single huge seating area around the perimeter of your room. Ideally, you want to create a main seating area with one or perhaps two smaller conversation areas with the same room. The first is perfect for your immediate family or a small gathering.The second and third areas are great for reading, writing in a journal, playing games or intimate conversations. I like two loveseat on either side of a fireplace with two chairs that are facing the mantel. I also like a love seat with two chairs across from it. I would avoid a love seat with four chairs in the same conversation area unless you have a really large room and can have additional conversation areas as well – it’s really too many chairs in one place I think, but they could go in a smaller arrangement. Maybe a loveseat and three chairs would work better. I worry about four chairs overpowering the loveseat. Additionally, think of creative ways of adding seating such as ottomans tucked under a side table or in front a hearth or even hung on the wall as I did in my house. Thirdly, this is where the beauty comes in…as far as solid or print, I’d say add some punch with either a print – floral, plaid or stripe or introduce some nice textures. If you do add chairs with a pattern, make sure to balance it out on your solid upholstery with complimentary pillows or throws! Three Tip Thursday – A Few of My Favorite Things! Whenever I discover something new I think of sharing it with you. It might be a new product I love, a favorite new recipe or an organizing tip that works for me! Today I thought I’d share a few of the things I love and if you like it, I just might make it a thursday routine! I was in Florida for eleven days last month working with my business partner GiGi. While there, I’m always guaranteed to come home with great new ideas and below is my is one of my new favorites. 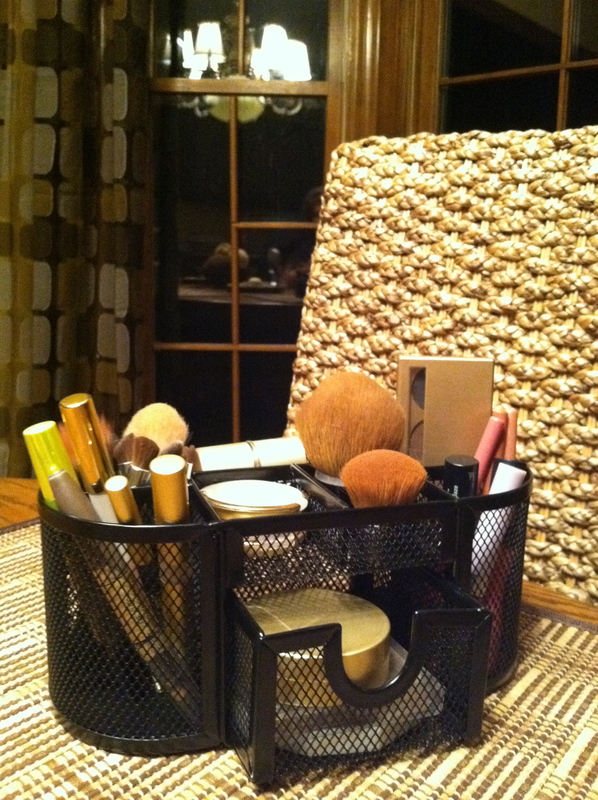 TIP # 1: The office organizer shown below from Wal-Mart sells for $15.54 online (I paid under $9 in the store) and is the PERFECT organizer for my make-up. I’ve always stored my make-up in a cosmetic bag and it drove me nuts to have to dig around to find what I want. Now, I might carry a small cosmetic bag with a few of the items in my purse for the day, but they always go back in this organizer when I get home. GiGi says when she travels, she just wraps it with cellophane and tosses it into her suitcase. I love that, don’t you? 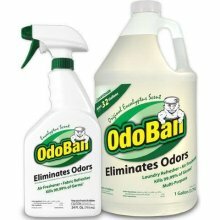 TIP #2: Another thing that GiGi introduced me to is OdoBan. I have a black knit jacket that I adore, but it had a musty smell to it. I just couldn’t get rid of that smell. Between you and I, I think I left it in the washer too long a while back and its never been the same since. That is until it met OdoBan. I picked some up at Sam’s Club when I got home and added a cup to the final rinse cycle and voila! The smell was gone. This stuff is amazing! Next, I added it to a load with my husband’s t-shirts and socks. This time I just put it in the dispenser for the softener. I Really, really like this product! 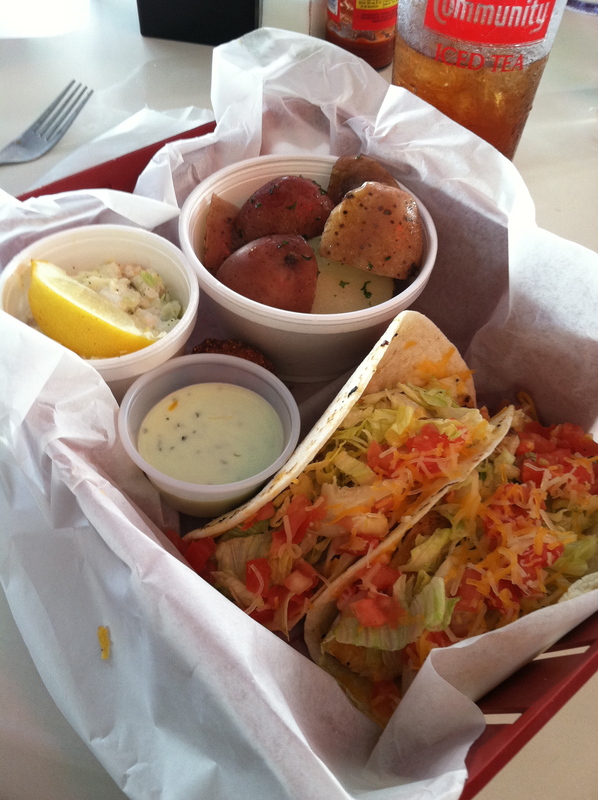 TIP #3: When I was in Florida on vacation with my family in July, my favorite dinner was Mahi Mahi Taco’s from The Shrimp Basket. I began with 1 cup of grape seed vegenaise (a non-egg mayo-like product sold in the refrigerator section of whole foods – it’s delicious if you don’t want to use mayo). 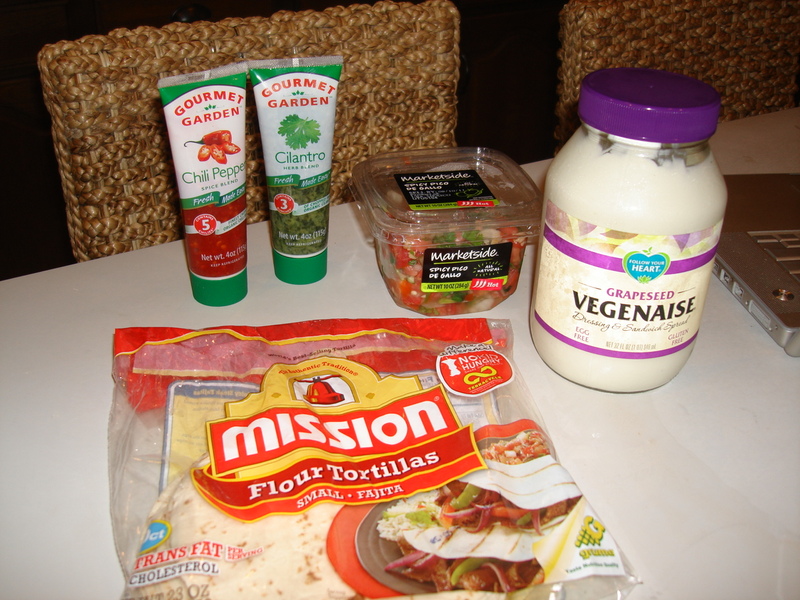 You could also use plain yogurt or sour cream or a mixture of any of the three. Using a whisk, I stirred in a splash of dill pickle juice (enough to make it thinner). Along with a generous squeeze (or two) of Gourmet Garden Chili Pepper (in a tube also). I taste as I go. I like it lightly pink. The darker the pink, the more of a kick it will have. Whisk the ingredients together and it’s the best fish sauce for taco’s ever! I served the taco’s with sweet potato fries and coleslaw. By the way, here’s a fourth tip…my favorite coleslaw is simple stupid, yet delicious. A cup of Marzetti’s slaw dressing (in the refrigerator section) + a one pound bag of shredded cabbage = the best slaw ever. Don’t bother with a fancy schmancy recipe. You can’t beat this. Yum.